NASA tells us why many Hubble images have a strange stair-step appearance: “These images come from a scientific instrument called the Wide Field and Planetary Camera 2—or WFPC2—which was removed from the telescope in mid-2009. It is WFPC2’s unique design that underlies the oddly-shaped images in Hubble’s portfolio.” This stair-stepped image depicts Star Cluster NGC 2074 in the Large Magellanic Cloud. Image credit: NASA, ESA and M. Livio (STScl). 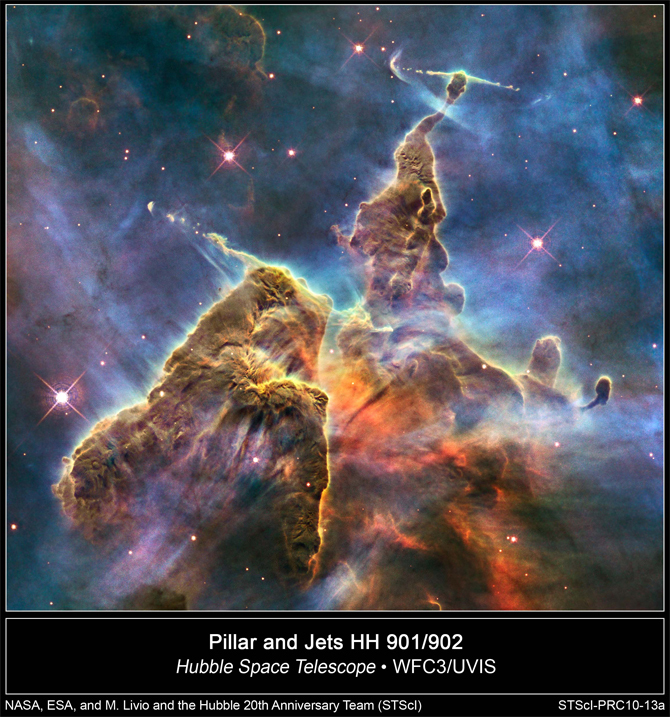 Hubble’s images sometimes appear to be missing part of the picture. That’s because one of its instruments—the Wide Field and Planetary Camera 2—records images with four cameras. One of those four cameras (the planetary camera) magnifies what it sees, while the other three (the wide field cameras) do not. When a picture is created (by assembling the four sections from the four cameras), scientists reduce the magnified (detailed) area so it matches the other three sections. It’s rather like zooming-in on one area of an object—so we can better study it—and then zooming-out if we want to produce a synchronized image. But when we zoom-out, we use less space and—for Hubble—that unused space has a stair-step appearance in the stitched-together picture. When Hubble’s first images were analyzed, scientists realized that the telescope had blurred vision. A shuttle mission, sent to repair the problem a few years later, was successful. Since then, Hubble has been sending incredible images backs to Earth. Its first ten years were amazing, but images from recent years have been even more sensational (like this view of "Pillar and Jets" (HH 901/902). Let’s examine some of the space telescopes’ most beautiful images—including those from its 20th anniversary. Bos, Carole "MISSING PIECES" AwesomeStories.com. Jun 01, 2008. Apr 23, 2019.